Melissa is one of the most known savory and medicinal herbs, which has been used by people for many centuries. About two thousand years ago, the Ancient Romans were first to discover the properties of this herb. It was found on the territories from Eastern Mediterranean and Balkans to south-eastern Siberia. Today, Melissa is cultivated throughout Europe, Middle Asia and Northern America. In natural environment, Melissa can be easily found due to its smell. 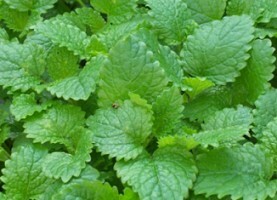 The whole plant and especially its leaves give off a smell of lemon, that is why this herb received the second name: Lemon balm. In phytotherapy, Melissa is especially valued for its two beneficial effects: sedative and antibacterial. That is why herbal specialists recommend it to the patients with such problems as insomnia and sleep disturbances, anxiety, nervousness, etc. Melissa has very string relaxing and calming effects, which is sometimes called “a herb for women”. Melissa can be used to ease the discomfort during problematic pregnancy or menstrual irregularities. Melissa contains 0.1-0.3% essential oil, the main constituents of which include terpenes citronellal, geraniol, citronellol, limonen linalool, rosmarinic and chlorogenic acids, flavonoids, eugenol and other phenylpropanol derivatives, tannis, various tars, etc. Many of these ingredients proved to have antiseptic and antibacterial effects. Therefore, Melissa is utilized in a number of remedies and medications for skin virus infections: for example, herpes and others. In addition, Melissa also has very good digestive and stomachic therapeutic properties. It helps to improve appetite and normalize the activity of digestive system, as well as calm stress-related digestive problems. Melissa has slight carminative and diaphoretic effects. The remedies based on Melissa extracts can improve the condition of the heart and can be used to reduce tensions, headaches, migraines and vertigo. With its mucous-reducing effects, Melissa can bring relief to those patients who suffer from chronic cough, astma, cold or flu. Finally, this medicinal herb can be used even to regulate sexual activity. In modern herbal medicine, Melissa is usually used in two forms: alcohol extract and oil extract. Alcohol extract is received by direct extraction and is used treat problems with stomach, sleep problems, various skin infections, as well as of cleansing and antiviral treatments. Lemon Balm oil is obtained by cold extraction and, in addition to the above, it is also used in cosmetics as nourishing skin treatment. Hi there, I found your blog via Google while searching for herpes cures and your post looks very interesting to me.